Uddina vade rocks the menu card, be it for breakfast, lunch, evening snacks or dinner. The darshini's (fast food joints of Karnataka) will have uddina vade 365 days a year. Even though people are calorie conscious, they dont mind eating one vade. Visitors to the South Indian States will always get a chance to relish the very famous "idli, vade & sambar". Idli, vade, sambar is both comfort & royal food for people belonging to South Indian States. Back at home, my mom prepares this vada only on Vaideeka/Tithi/Shraddha & on Mahalaya Amavasye (New moon day of Pitrupaksha). She says, we are not supposed to prepare this on other days. Spinsters are not allowed to help their moms on that day or for that matter, they are not allowed to enter the kitchen too. Only married women shall observe fast & cook the food for all of us. Hence, I never got an opportunity to look & learn this recipe. 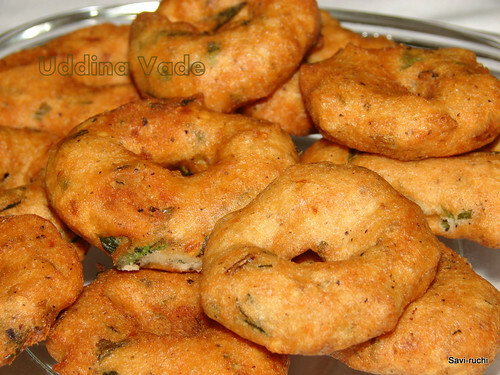 But my mom used to always share her experiences while cooking this vada. She doesn't use either mixer or grinder to prepare the paste. She does it using the age old oralukallu. She briefed me about this recipe & TADA.., it was super soft & tasted great. I have never gone wrong while preparing this. Soak the urad dal in water for 2-3 hours.Wash the dal thoroughly & prepare a smooth paste out of it. Add 1-2 tbsp of water to prepare the paste (avoid as much water as you can). Scoop out the paste, add all the above mentioned ingredients (except oil of course). Mix it gently. Heat the oil in a broad pan. Make a small lemon sized ball of the paste. Apply water to your left palm & gently pat the ball. Make a hole in the middle of the patted ball. Dip your right hand fingers in water & gently remove the vada from the left palm & drop it in oil. The oil might sizzle as your hands are wet. Deep fry on a medium flame until golden brown. 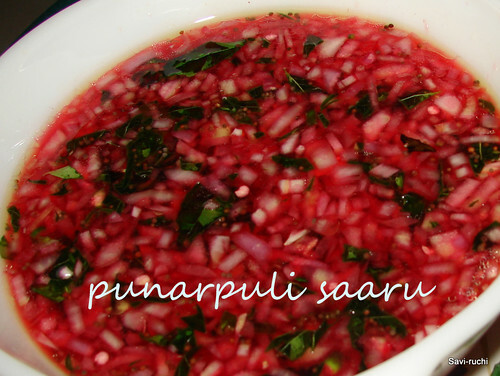 Serve it hot with sambar, chutney of your choice. Some people keep the urad dal batter for fermentation. But, according to my mom.., it should be prepared as soon as it is scooped out from the grinder/mixer. 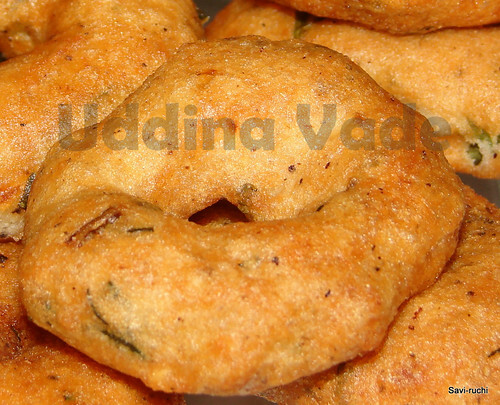 This helps in preparing soft vada. Chiroti rava or small rava could be substituted with rice flour. 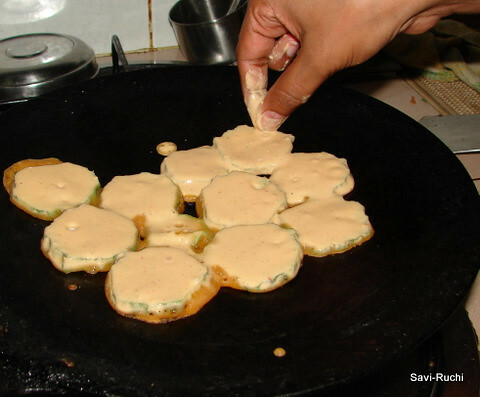 Addition of either rice flour or chiroti rawa helps to obtain a crisp outer layer. Some people even prepare the vada on a plastic sheet & then transfer it to oil. Feel free to add onions, if your family prefers it. 11a.m: Come back from playground. atthe(my mom-in-law) would bathe him. He used to perform prayers & recite some shlokas. 11:30a.m: Ajja (my father) would feed him breakfast. 12:15p.m: Thatha (my father-in-law) would somehow make him drink 1 glass of water. 12:30p.m: Play with all 4 of them. 2:00p.m: Delicious & steaming hot Udupi oota/Chikmagalur oota prepared by atthe/ajji. Ajja would feed him lunch, while thatha managed to play his favorite Kannada rhymes CD(undagi gunda.., ache mane subbamma etc). 5:30p.m: Wake up. Get bathed from atthe, and drink milk from ajji. Go to playground with either ajja or thatha. 6:30p.m: All 6 elders & he parading in the city streets. 10p.m: Back home, dinner fed by ajja, rhymes played by thatha. 12midnight: Go back to sleep with amma(me). Yesterday, when they departed, he was weeping & was not letting anybody go. Same was the case with the two grandma’s. After coming back from airport, he searched his grandparents in kitchen & all the bedrooms. He became cranky & started missing them. Our state is also the same, just the difference being.., he is expressing his feelings.., WE ARE NOT!!! My friends can notice the difference in me. They say, i have changed. It is just 15 days & they can see the change in me. Oops, I have to control myself, else I will have to repent for this. I'm shocked that I have got a noticable change already. Guys, wondering what that change could be!! I am sure most of you have guessed it already. The change is....., I have put on weight (aiyyo rama!!!) & the credit goes to parents & in-laws. Both are cooking lot of traditional dishes & we are enjoying every bit of it. They are also refreshing my memories with these dishes. I am happy that, I am learning lot of new recipes from my mom, mom-in-law & also fine-tuning my recipes to get the authentic touch. 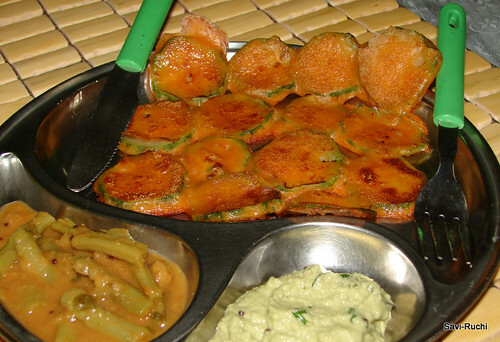 Bajji is a Tulu word for Gojju (Kannada) or curry in general. Sevu is a Tulu word for Taro or Colocasia leaves(Kesuvina yele in Kannada). *Wash the leaves thoroughly. Remove the hard stem. Apply little coconut oil to the palms & chop the leaves. Chop the green chillies. *Mix the green chillies & leaves. Add 1 cup water & cook the leaves on a medium flame for 10mins. Now add, the tamarind, salt & boil again for 5mins. Allow it to cool. *Meantime, heat oil in a small pan. When oil is hot, add urad dal & fry till dal turns golden. Turn off the heat, add coconut & let it cool completely. 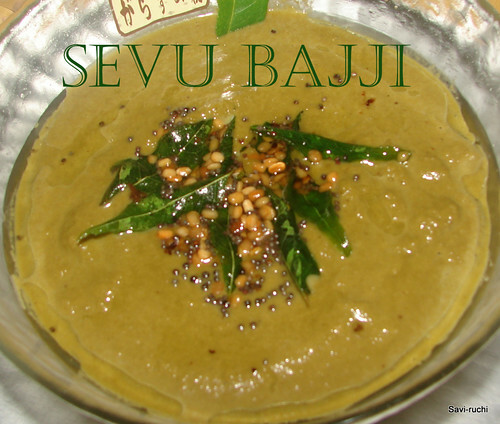 *Make a smooth paste of coconut & urad dal, add the leaves to the coarse paste & pulse it in the blender for 10secs. *Prepare the tempering. Heat oil in a small pan. When oil is hot, add mustard seeds, when mustard seeds splutter, add uradadd garlic & sauté till garlic turns golden brown. Add curry leaves & pour this tempering over the gojju/bajji prepared. 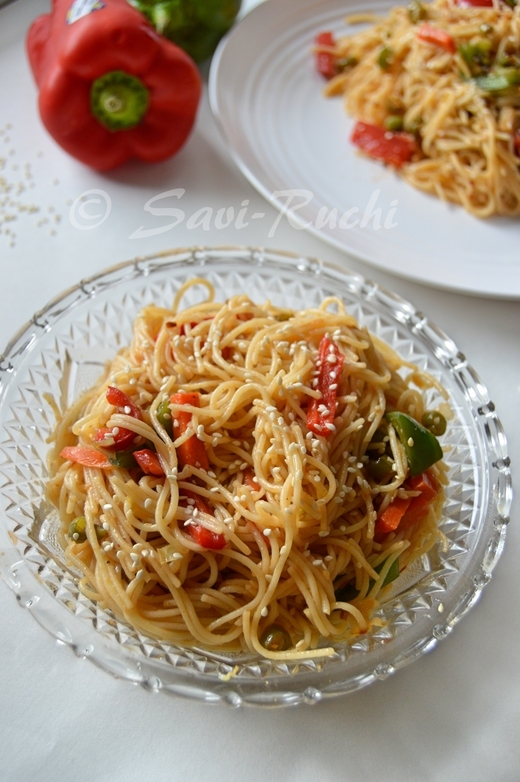 This dish goes to "RCI: Udupi & Mangalorean Cuisine" hosted by Sia & also to Lakshmi.